Last weekend we had a friend visit us from Cape Town. It was his first visit and he pronounced himself delighted with our charming little city. On Sunday we took him up to the Monument to get his bearings and enjoy the view. 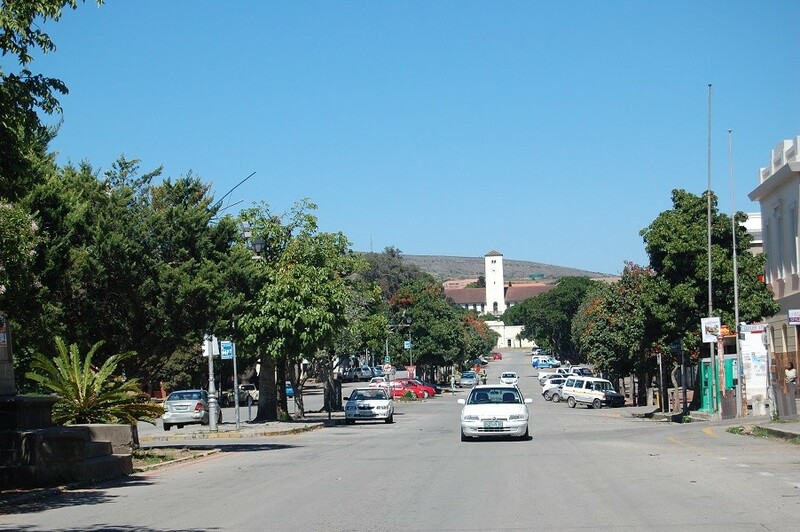 As we observed Grahamstown nestling in its perfect oval hollow, I felt a rekindling of affection for my dear hometown. This initiated a rush of reflections of all its quirks and quiddities that influenced my settling here over some fourteen years ago. A brunch in the Botanical Gardens on a glorious summer’s day is the way to go! Lying on the grass and observing the variety of old trees enriching the skyline was reminder of the care that has gone into establishing this centre of learning. The plethora of well tended species, some over 200 years old, left us all feeling grateful for the botanists, horticulturalists and gardeners for creating and maintaining this precious green corner of our tired old planet. These sentiments were enhanced by the sound of a tenor saxophone blowing in the breeze. Following it, we discovered there was a free concert at the Provost. The highlight of which was a set by the DSG and St Andrews Jazz Band. People of all ages and their dogs relaxed, enjoying an eclectic mix of genres provided by promising young Grahamstonian musicians. Later I repaired to one of our local supermarkets for a few provisions. Here I was reminded of the unsung heroes and heroines who work our stores. To be a teller cannot be a wonderful occupation – dealing with money and the often frenetic public of which so many are the centre of their own universe. Yet it never fails to astound me that the tellers are always so pleasant and friendly. I salute them. Wandering home through streets housing Victorian buildings and flower filled front gardens of quiet charm, I encountered two donkeys browsing on the verge. Extremely chilled, as is the wont of donkeys, they received my pats and blowing into their noses nonchalantly. The regular visitations of livestock from their grazing land near high density township is the source of joy to this old farm girl. The daily sight of donkeys and goats gobbling in the refuse bins of Kentucky Fried Chicken in Market Square and cows going walkabout through the well tended salubrious suburbs has a touch of anarchic incongruity. Doubtless infuriating to gardeners, I thought yesterday, when I observed four goats quietly demolishing a fabulous crop of nasturtiums in Cathedral Square! A stroll down The United Nations of busy Lower Beaufort Street, its pavements awash with the goods of ever cheerful vendors ... the wonderful smell of old books and antique furniture in the Hill Street Library ... repairing with friends to Nyamafundini for a platter of ‘Chisa Nyama’ washed down with a cold beer on a hot day in Joza ... multi uniformed schoolchildren ... these and more constitute the Grahamstown I adore!